La Toya Jackson, 62, is the Alien in “The Masked Singer” as many viewers of the Fox reality singing competition show have guessed. Before her unmasking, the sister of the late Michael Jackson sang “Exs and Ohs” by Elle King, 29. 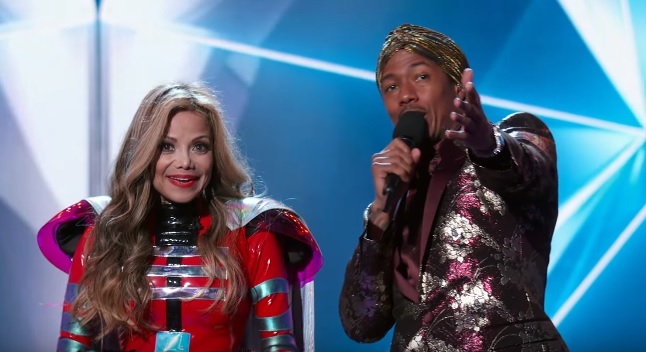 As the Alien, La Toya was one of the six remaining mystery celebrity singers who performed in “The Masked Singer” Season 1 episode 7 titled “All Together Now,” which aired on Fox on February 13, 2019. Featuring the Alien, the Lion, the Monster, the Bee, the Rabbit and the Peacock, the episode marked the first time all remaining “The Masked Singer” contestants are together in one episode. When the Alien said she has been on the New York Times’ bestseller list twice, Scherzinger guesses the masked singer could be Nicole Richie. But when Scherzinger recalled the previous snake clues, she said the Alien could be La Toya since she owns a pet snake. McCarthy guessed Paula Abdul but Smoove said the masked singer’s legs were not muscular enough. In the end, the Alien received the lowest number of votes from the audience and the judges and with host Nick Cannon by her side, she unmasked herself and was revealed to be La Toya. Born on May 29, 1956 in Gary, Indiana, United States, La Toya is the fifth of the 10 children of Joseph Jackson and Katherine Jackson. As a singer, La Toya released nine studio albums released between 1980 and 1995 and one extended play released in 2011. In 2007, La Toya was sworn in reserve police officer in Muncie, Indiana as shown in “Armed and Famous.” She also competed in “The Celebrity Apprentice” in 2011 and in “All-Star Celebrity Apprentice” in 2013.